When setting up an e-commerce store, the majority of the entrepreneurs usually assume things will automatically work out, and they will start making good money from sales. Unfortunately, this is not always the case. Setting up an e-commerce store is just a fraction of the work and plenty much is required to attract visitors to the site, convert the traffic and retain customers by winning their royalty. If your website is not performing as expected, it is wise to first to investigate where your e-commerce store is failing. Where is your website failing? An e-commerce website has three levels where failure in either can deny you the much-needed sales. 1st Level – Attracting-the-buyers phase:- to make sales you need to attract buyers. You need to attract new visitors and returning visitors to your site. Failure to attract visitors means you will have no one to sell two. 2nd Level – Conversion stage:- Attracting visitors to your site is not enough if they will visit and leave without interaction or buying. Consequently, it is essential first to attract the right or most appropriate customers. Otherwise, if you net the wrong traffic, you will end up with just a high bouncing rate. You also need to avoid losing visitors due to inaccessibility by ensuring your e-commerce is responsive and easily accessible on any device. 3rd Level – Retention stage:- After making the first sale to a client things don’t just stop there; you need the customer to come back and buy more. The 3rd stage is all about ensuring the return of the clients. With the correct identification of the stage, your website is failing you can amicably solve the bottleneck and boost your sales. Here are the basic tips we have found to work wonders to non-performing e-commerce sites. 1- Vigorous, specific-target-market oriented advertising – Yes, this may sound a cliché, but advertising remains a principal aspect in sales and marketing. For a site to be known, especially a start-up making an entry into the marketing, it essential to market it. Advertising is all about familiarizing your products and services to consumers with an emphasis on how your product is better than alternatives. 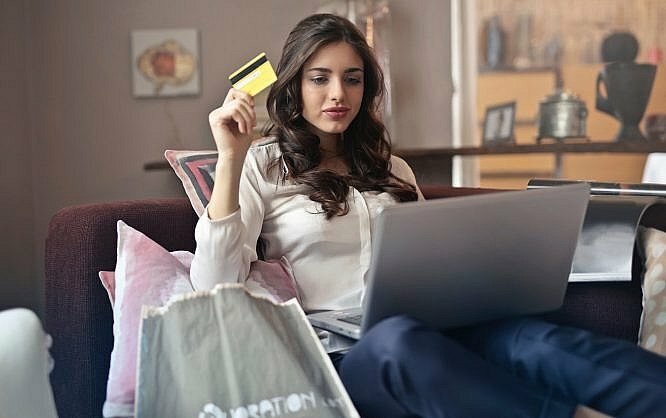 E-commerce has emerged in an era that has seen a drastic evolution of advertising from the use of mainstream media to digital platforms with numerous new advertising techniques. The secret behind successful advertising is knowing the right platform to advertise and the most appropriate advertising technique to use. 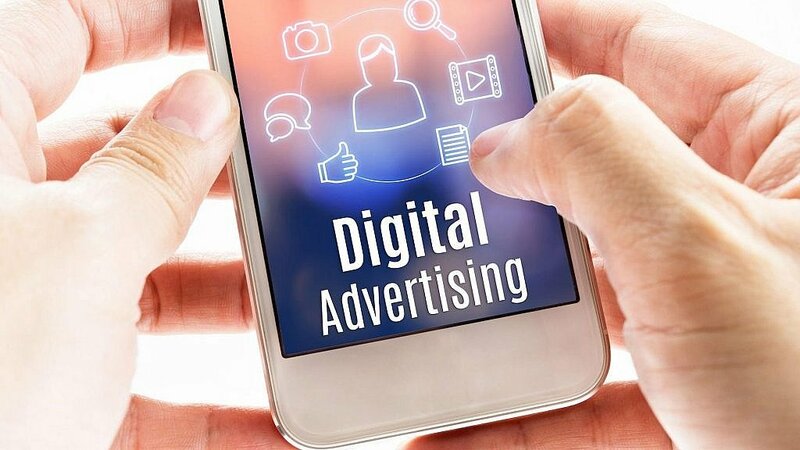 Digital advertising offers many advertising platforms/channels one can use including social media marketing, search engine marketing, influencer marketing, etc.. Identify the right platform is guided by the target market; aim to advertise on the platform where your target market is dominant. For example, if your target market is the youth, the social media where the youth dominates such as Facebook, Instagram, Twitter, etc., should be your primary advertising platform and your language should be more informal and fun. On the other hand, if your target market is other businesses, LinkedIn is the best social media platform for B2B advertising, and your advertisement should be more formal with an official tone. Advertising on these platforms can take different forms from having a branded account, publishing posts or paid ads. Google shopping advertising – is a type of ad designed for e-commerce site where a product, its image and detailed information including its price are featured on the search engine result page. The listing can be individual items referred to as “Product Shopping ads” or several related items referred to as “Showcase Shopping Ads. 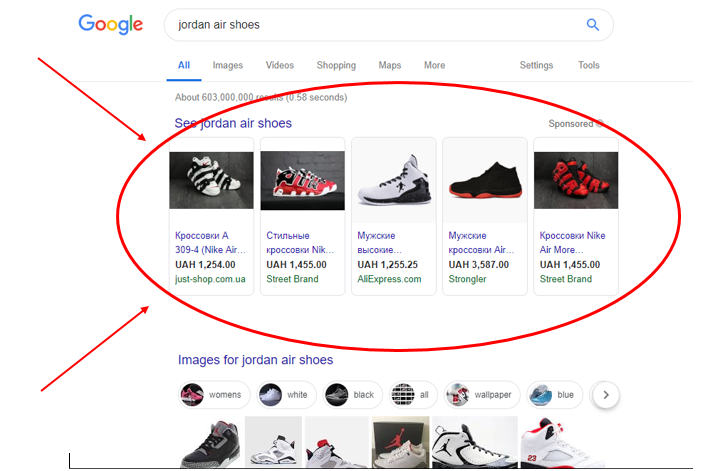 Shopping Ads makes it easy for the consumer to find a specific item instantly on the search result page and on clicking the ad the potential buyer is directed to the product’s e-commerce page. The technique nets more traffic compared to the standard search engine ranking and can be the breakthrough a non-performing e-commerce site needs. 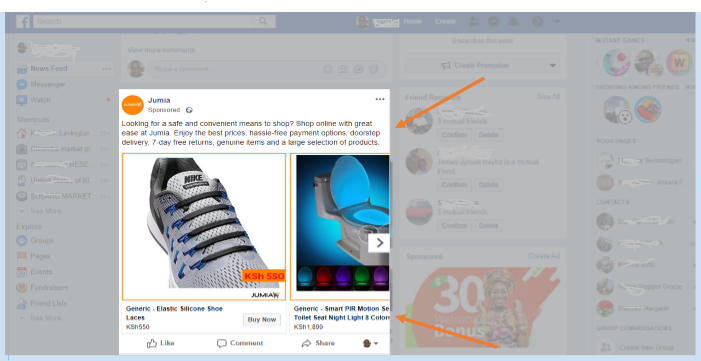 Remarketing/Retargeted advertising – if you browse or buy products/services on e-commerce site, I am sure you must have notices ads of the very same products you were viewing or related product following you as you visit other websites, social media or email especially Yahoo mail. This technique is retargeted-advertising – an effective marketing technique that utilizes the user’s browsing habit. It is a form of Pay-Per-Click advertising that any website owner can utilize to net traffic of either people who had visited their site earlier or those who had visited another site with similar products. The technique uses browsers’ cookies to gather information about the users browsing habit. The collected browsing data is then used to direct the ads to the specific users who had visited an e-commerce site re-netting the bouncing. This traffic is very likely to make a purchase. Search advertising – this is search result oriented advertising and include Google Ads and Bing Ads. When a user searches a set of keywords, Ads appears alongside the organic search results usually at the top of the organic search result. As a result, an e-commerce site that would have barely made it to the first search-result page gets a competitive advantage and ranks at the top. The website ranking is pushed to a position that nets huge traffic increasing the probability of conversion. 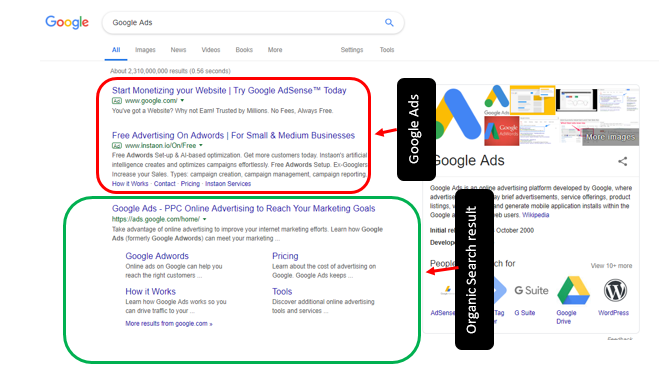 Google Ads ranking at the top of the organic search result. 2- Optimizing your content with a target of ranking position zero (at the top of the search result page) – paying alone to rank at the top of the search result page cannot be sustainable, your website also needs to rank well organically which can only be achieved through optimization. The higher your e-commerce site ranks on the search result page, the higher the traffic it nets. Optimize your e-commerce site with a target of ranking first on the search result page and this supplemented with paid ads is a sustainable way of getting high traffic. 3- Reduce site bureaucracy – e-commerce sites lose a significant percentage of their incoming traffic to the complex long registration process that is compulsory in many e-commerce sites. The forced registration is estimated to account for up to 35% of the abandonment rates. The sign-up process should be as easy, short and less time consuming as possible. If possible configure your site to facilitate guest’s check-outs making signing up optional. In such a scenario you can entice clients to sign-up such as by offering a percentage discount to the registered users or free delivery. The less the bureaucracy, the less the traffic bouncing rate. 4- Improve user experience – the current generation is a generation of less patience, less tolerance, high efficiency and always looking for a better option, and for your e-commerce to be successful, it must meet the current generation demands. Improve your website UX ensuring the site is light enough to load quickly, is accessible on any device, is easy to navigate and the best-selling items or items on sale/offer are showcased. Besides, you can try to improve the readability of your e-commerce site by de-cluttering the pages, easing navigation, maintaining adequate whitespace between products, and using manifest headers and price listing. 5- Personalized call-to-action – another prone area that potential buyers get lost on e-commerce site is the call-to-action. Some e-commerce sites are developed complicated with hidden call-to-action buttons, ending up losing potential buyers who have no time to browse around and experiment. A good e-commerce website should have a clear, personalized call-to-action. 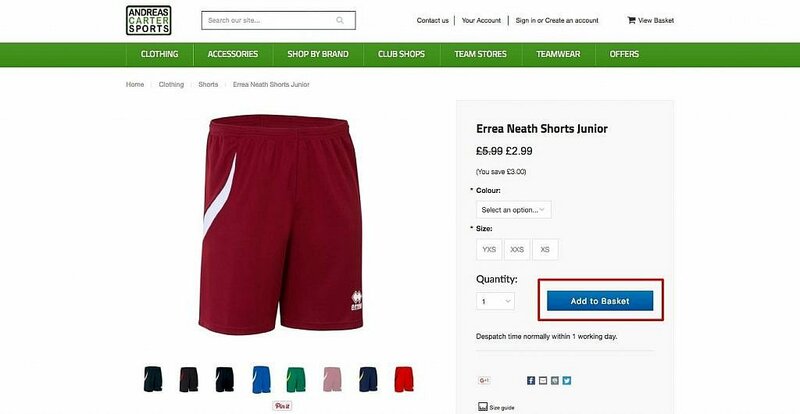 For example, the experienced buyers who do not necessarily need to read through the product details should be able to see and click the buy button on the product listing page. On the other hand, the in-experienced buyers who need to click to view or preview the product should also have the buy button on the subsequent pages. 6- Clear communication – communication is key to every business and an active ingredient in building customer loyalty. For an e-commerce website communication should be two way, buyers/potential buyers to the e-commerce site and e-commerce site to the buyers. From the onset, potential buyers should be able to contact customer care as efficiently as possible either through live chat or email. After making a purchase, buyers should also be able to reach customer care in case they have issues with the delivery, they are unsatisfied with the product or to make any other inquiry. On the other hand, the e-commerce site should be able to respond to the buyers’ inquiries as instantly as possible and offer them the needed assistance. After, a successful transaction, a client should also get an opportunity to give their review, which should be displayed publicly on the site whether negative or positive. The reviews boosts the e-commerce site legitimacy and authority, builds customers trust and statistically over 70% of the consumers consults a product’s review/rating before making a purchase. The site should also respond to the consumers’ review where necessary. Effective communication that solves issues leaves the clients satisfied and loyal to the e-commerce site. 7- Email marketing – the operation of an e-commerce site is more of a cycle than a linear process. Making a successful transaction is not the end of the road; the e-commerce site requires the buyers to return and buy more in the future. As a result, the technique of email marketing was developed which is an effective way of contact buyers who have registered on your e-commerce informing them of new goods, new offers and discount to attract them back. Earning from an e-commerce website takes more than just having an e-commerce website developed. It is one thing to have an e-commerce website up and running and a different thing to start making sales from the e-commerce site. There are three other phases that follow the development of an e-commerce website; introducing the website to the consumers and attracting them to the website, converting the traffic landing on an e-commerce website and finally attracting back the successful buyers. Knowing the stage your e-commerce site is failing is the first step of turning around the tables and boosting the sales. The tips above for different stages may a be a good starting point of having a functional e-commerce site. Abhimanyu Arora is a creative director at mindsmetricks.com headquartered in Dubai helping clients achieve perfect balance between UI & UX. The recent projects launched by him have been highly appreciated in the design space. You are here: Home / Is your E-commerce Store performing poorly? – Here are essential tips to turn around tables and boosts your sales on e-commerce.